Its official – Christmas is coming! With just 24 days left until Christmas Day, we thought we’d get into the Christmas spirit with Christmas Cracker film countdown to get you in the festive mood. We will be counting down our favourite Christmas films, from family favourites such as to THE SNOWMAN and THE POLAR EXPRESS to romantic comedies such as THE HOLIDAY and LOVE ACTUALLY. First up is HOME ALONE. Written by John Hughes and directed by Chris Columbus, HOME ALONE tells the story of Kevin McCallister (Macaulay Culkin), an 8-year old troublemaker who is accidentally left home alone when his family flies to Paris for their Christmas vacation. Kevin’s excitement at being left home alone however soon turns sour when he must protect his home from a pair of burglars Harry (Joe Pesci) and Marv (Daniel Stern) who plan to rob his house on Christmas Eve. 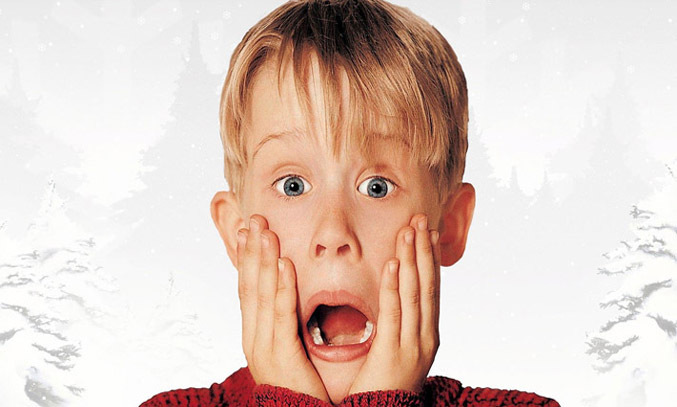 The concept for HOME ALONE came to writer John Hughes during the filming of UNCLE BUCK (1989), a family comedy which also stars Macaulay Culkin. In UNCLE BUCK, Culkin interrogates a would-be babysitter through the letterbox to make sure she’s not a baddie. The scene inspired Hughes to write a new movie and the rest, they say, is history. Also keep your eye peeled for Macaulay Culkin’s younger brother Kieran who landed himself a part in the film as Kevin’s bed-wetting cousin, Fuller. Since its release in 1990, HOME ALONE has become the highest-grossing live action comedy film of all time in the US, spawning four sequels including the 1992 film HOME ALONE 2: LOST IN NEW YORK, the only HOME ALONE sequel to have the original cast reprising their roles. The film was also nominated for two Academy Awards, one for Best Original Score (John Williams) and the other for Best Original Song for “Somewhere in My Memory”.